Recently, my friend Amber and I aimed to preserve the last of the local apple harvest by canning homemade applesauce. It was our first adventure in canning, and it was a perfect starter project. The applesauce was simple to prepare, and the high acidity of apples made the canning process simpler too. To get the best flavor, we picked our apples at Larriland, a local pick-your-own farm. We picked 15 pounds of small to medium sized fuji and braeburn apples, and we got about 7 pints of applesauce out of them. Fill a large stockpot with an inch of water, add apples, cover and bring to a boil. Allow to boil until the apples are fork tender, about 10 minutes. Strain apples, reserving cooking liquid. Blend apples in a food processor, adding cooking liquid as needed to reach the desired consistency. Add sugar, lemon juice and cinnamon to taste, if desired. Applesauce is now ready for processing (canning). If you plan to eat your applesauce right away, you can skip canning and simply refrigerate or freeze your applesauce. Otherwise, follow the instructions below. Canning allows for long term food storage without refrigeration. Properly canned foods don’t support microbial life thanks to a combination of high acidity, low oxygen, and/or high heat treatment. Sterilize jars and lids by submerging in rapidly boiling water for at least 10 minutes. Keep hot until ready to fill jars. Fill hot jars with hot applesauce, leaving a half inch of headspace at the top of the jar. Wipe the rim of the jar clean before setting a hot lid on top. Secure lid by firmly tightening the lid ring. Once processing is complete, remove the jars and allow them to cool undisturbed for 12-24 hours, leaving at least 1 inch of space between jars on all sides. As the jars cool, their contents will contract, creating a vacuum which will hermetically seal the jars (you may hear a popping sound as the vacuum pulls the lid downward). 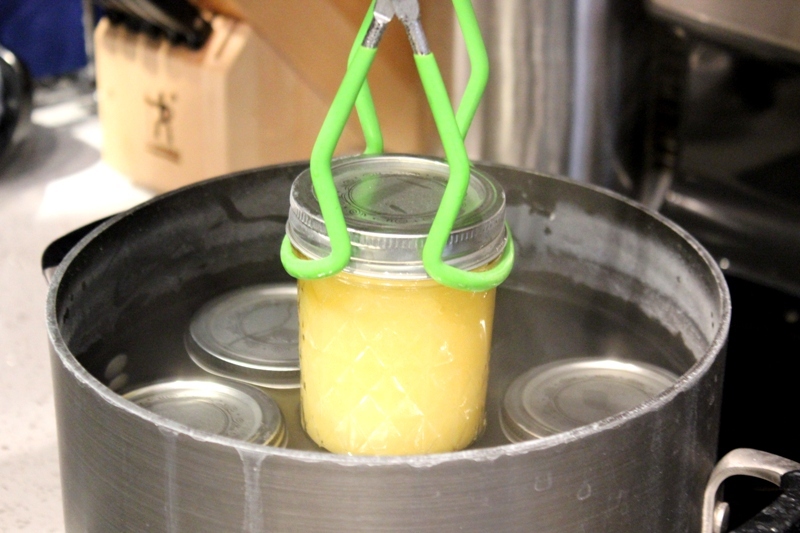 Once the jars have completely cooled, you can test the seal by pressing on the center of the lids. If the lid is popped up, then the seal failed and the applesauce should be refrigerated. Once jars have cooled, remove the lid rings and allow them to dry completely. This prevents them from rusting. Calcium deposits left on jars, pots, and cooking surfaces may be easily removed if they are first soaked in vinegar water or rubbed with slices of lemon. Reserved apple cooking liquid tastes like fresh apple juice. Refrigerate and enjoy as a beverage. If you’re interested in canning your own fruits, I suggest you check out the USDA’s Guides to Home Canning. Just remember that the leading cause of botulism is improperly home-canned foods, so make sure you meet or exceed all processing requirements for the type of food you are canning. Boiling water bath canning, like that that used for applesauce, is only appropriate for foods with a pH of 4.6 or lower (that’s fruits and most tomatoes). Foods with a higher pH, such as meats and most vegetables, must be processed in a pressure canner, which can reach much higher temperatures. I look forward to using canning and other preservation techniques to extend the life of all sorts of seasonal produce. This winter, I’ll definitely have my eye on some in-season citrus. Happy (and safe) canning! This post is fantastic. I never thought I’d feel something like canning could be within my reach but this really lays out exactly how to approach it. That applesauce sounds DELISH. Nice piece, Amanda! And what a wonderful time I had sharing our first canning experience together! Can’t wait to sample some of the braeburn sauce. YUM!